Since 1852, The Lake County Fairgrounds of Crown Point, Indiana have been the proud site for the Lake County Fair. In early August, as it has for many years, the fairgrounds welcome thousands of visitors. 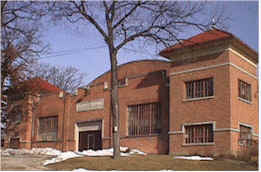 The fairgrounds provide an attractive setting: historic brick exhibition buildings (see photo), tree covered hills, rambling walking paths, Lake Countys only covered bridge (see photo on this page), and a historic grandstand near the swimming area. As Indianas largest county fair, the Lake County Fair proudly hosts 4-H displays, agricultural showcases, entertainment events, food and craft booths, and a wealth of other summertime enjoyments. When is this year's Lake County Fair? From the Crown Point Square, go south on Court Street about one mile. The fairgrounds are on the west side. The historic covered bridge is displayed so fittingly in the heavily wooded Lake County Fairgrounds, one would think it was built just for that spot. Though now nestled in an eye-pleasing setting and used to span a gully, the covered bridge was moved in 1933 from Rush County (in southern Indiana). Originally built in 1878, the covered bridge continues to please those who cross it. Crown Point, Indiana 1834-1984: The Hub City. L. E. Laney & Son, Crown Point: 1984.